No, we're not spending summer in Paris unfortunately, however I realise I need to up my game in naming my creations, à la Dolores's auntie Rehanon. 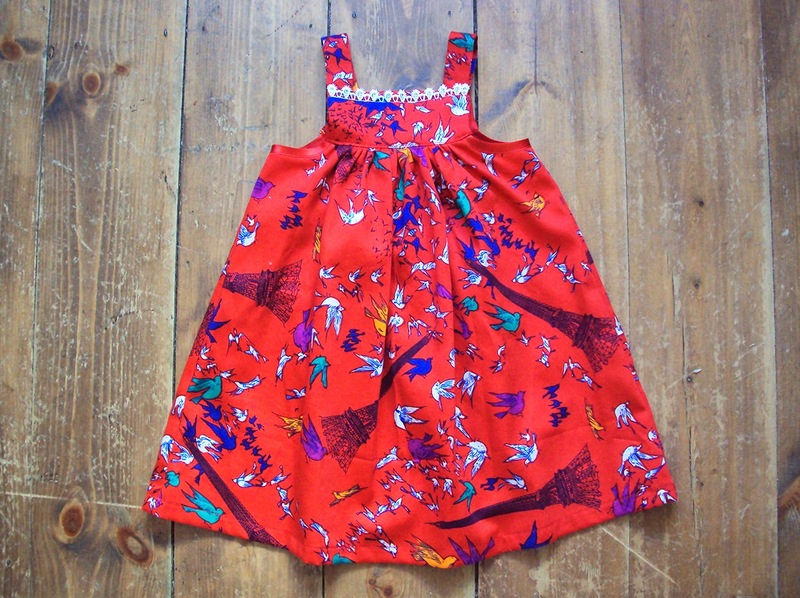 This is the first make from the batch of sewing patterns that were kindly sent to me from Adey from The Sew Convert. I stated in my last blog post that I was going to attempt to use each of the patterns sent to me by Adey, Catherine and Jenna, so I'd best get on with it! But don't get me wrong, I don't think that there's any point in making clothing for her just for the sake of it. She has plenty of clothes for her current size, however she doesn't have a 'special dress', if a baby needs such a thing. We were invited to lunch a couple of weeks ago and that provided the catalyst for getting this make completed. I used the pattern pictured below, Newlook 6718, view B omitting the contrast lower band. The pattern was already cut to the Small size, which according to the pattern envelope should have been almost too small for Dolores in terms of weight and definitely too small for her in terms of height, but the final garment actually came out quite roomy and may even span two summers. Win! As you can imagine, this pattern sewed together very quickly, particularly because I left off most of the faff and frills. Unusually, the dress fastens with buttons on the back, kind of like a backwards pinafore, so I chose the flattest buttons in my stash so hopefully they won't be uncomfortable when she lies down. I did add a single strip of lace from my stash along the top of the front yoke for a little bit of extra interest, and to make it clear that I HADN'T put the dress on her the wrong way round if people were to notice the button fastenings being on the back! The only part of the construction that I changed was the method for binding the armholes. I preferred to trim away the seam allowance and apply the binding to cover the raw edge, making it visible rather than tucked away on the inside creating lots of bulk. I've recently reorganised my fabric, putting the pieces that are too small for adults' garments, but large enough for a child's garment, or at least part of one, in a separate storage tub. This is the tub I plan on mining for Dolores-projects and this awesome Eiffel Tower and birds print cotton sateen scrap was residing within. I originally bought a long length of this fabric about a squillion years ago from Goldhawk Road, before I started this blog and before I realised that the circle skirt style I'd made from it wasn't for me. I think I donated the circle skirt to a friend, but I still had some fairly substantial leftovers, enough for this project. Aside from being an amazing print, it makes sense to use it for a garment for Dolores because A), despite being cotton it doesn't crease very much, and B) it's red which is the colour of her favourite foods (strawberries, raspberries and tomatoes) so I won't need to soak stains out of this garment, unlike every other garment she owns. In fact, remind me going forward to make everything for her in red and dark colours with busy prints! 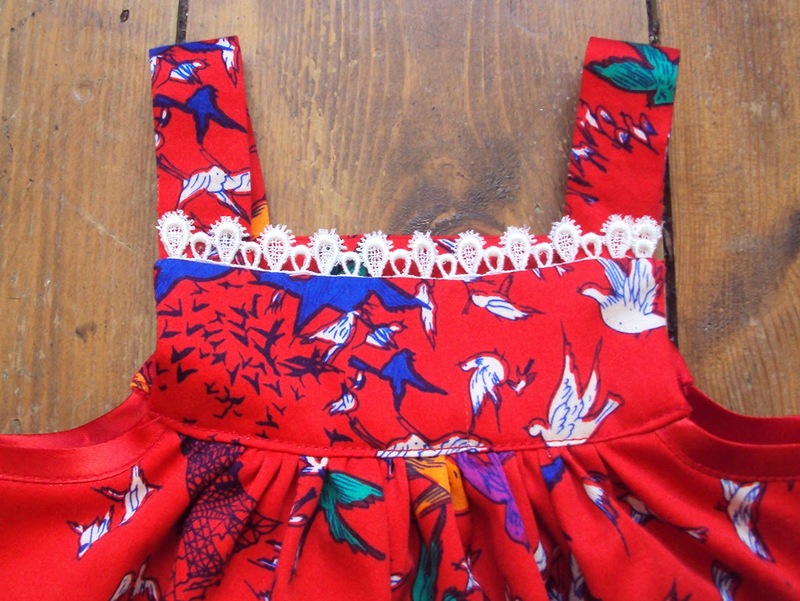 I have firmly got the children's-clothes making bug, which is pretty handy when you think about it, eh? 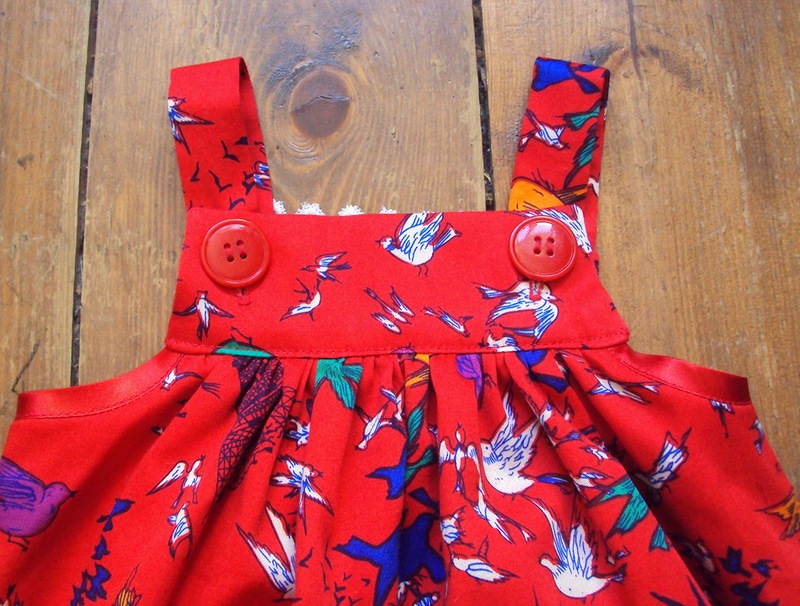 Making things for babies/toddlers/children requires less time and less fabric, which is perfect at just the time in life when you have reduced amounts of sewing time, and reduced funds to spend on sewing projects. It is my aim to dress Dolores as far as possible in handmade clothing, and for it to be made from my stash of fabric and notions as much as I can. But it is also my aim for those clothes to be beautifully made and stylish. That way she will hopefully look back at them and feel proud of her mama for making them for her, and also so that they will have further life after Dolores has grown out of them when other children wear them. And who knew 'mother lode' was spelt 'mother lode' and not 'mother load'?! Not me until I did a spot of googling just then. Anyways... I am one lucky baby-mama because I have recently received not one, not two but THREE packages of baby/toddler sewing stuff from super lovely sewing bloggers. 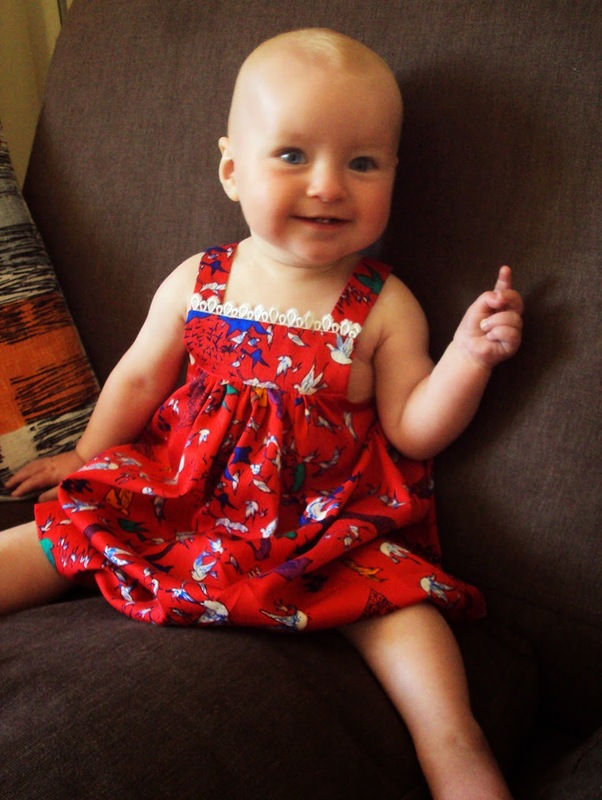 Up until now, I have mainly dressed her in secondhand and hand-me-down things because she's been growing too damn fast. 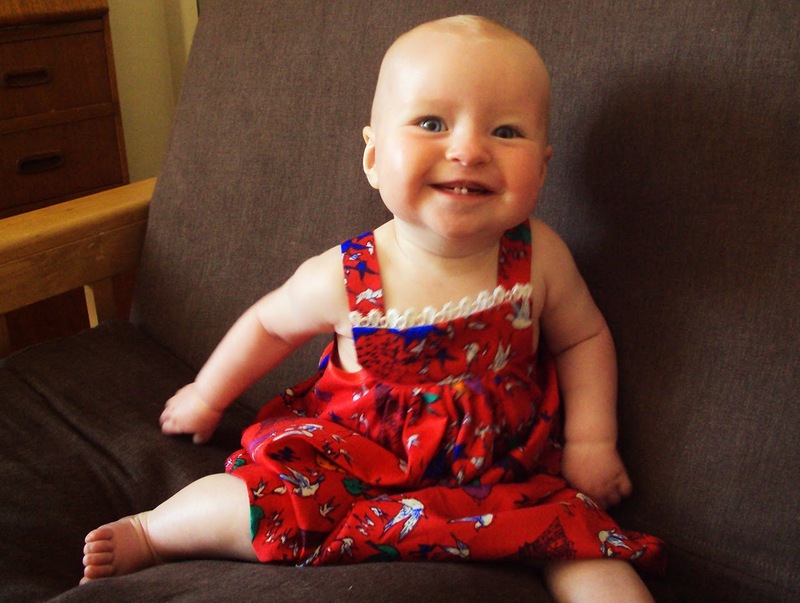 But I plan to make more of her clothing myself as she gets bigger, with a dose charity shop scores and hand-me-downs for the difficult or boring to make things, and nana-knits for her knitwear. Which is just how I approach my own wardrobe I guess, save for the nana-knits. So let me show you the awesomeness that I now have to work with! 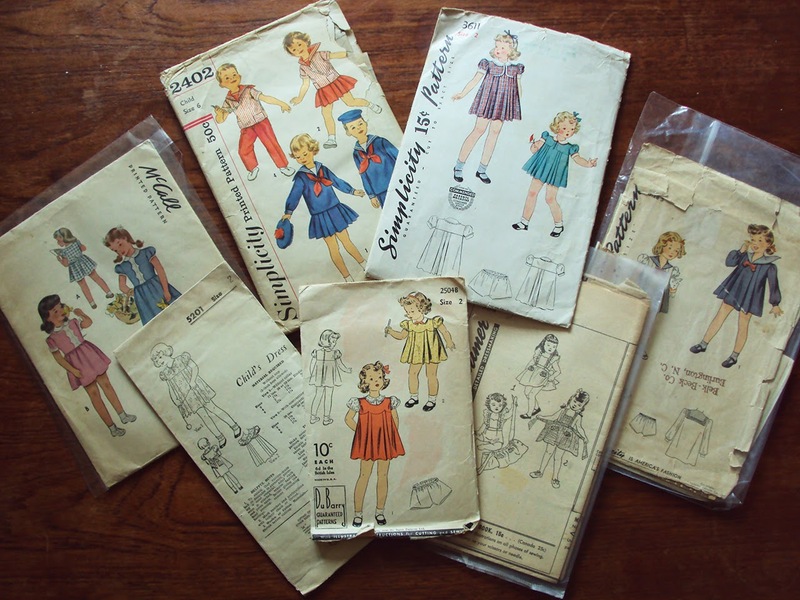 The top image is a whole of beautiful vintage sewing patterns that were sent to me by lovely Adey from The Sew Convert. Can you see that two of them have a nautical theme?! Amazing! She also sent me the four patterns in the bottom row of the image above (one of which I have just finished using, blog post on it's way...). The top row of pattern in the image above were sent to me by fabulous Jenna from Just Sew Jenna. As you know, I have already used the romper pattern, and I can't wait to get stuck in to the others. 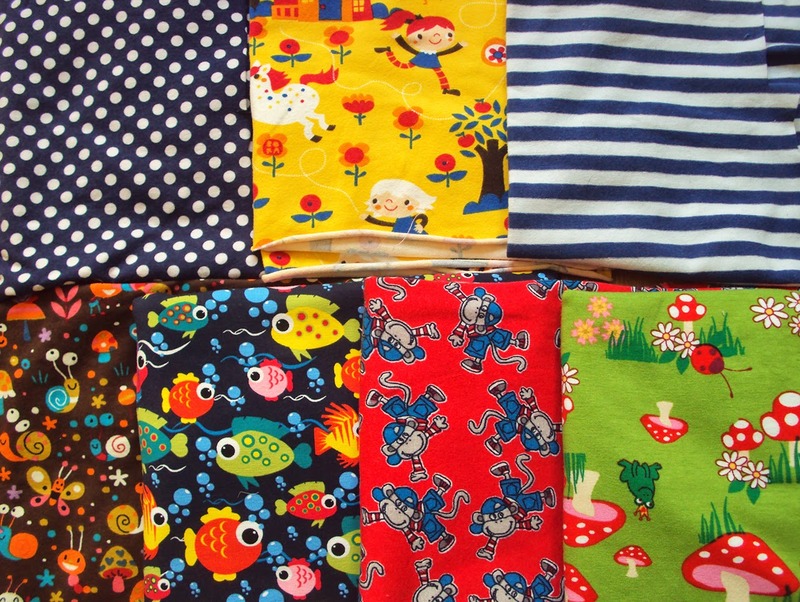 She also sent me the fabric on the top row of the image below to incorporate into my makes. 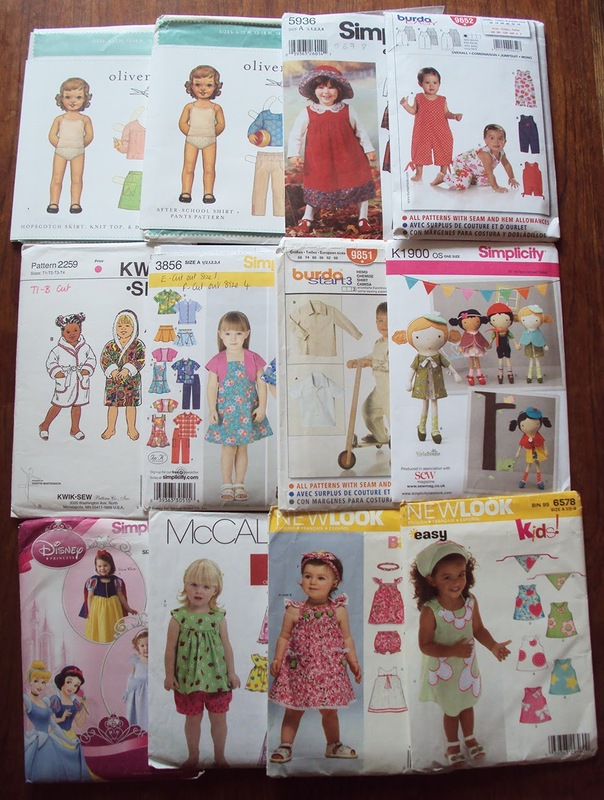 The middle row of patterns were sent to me by wonderful Catherine from Clothes and Sewing, including a super cute dolly sewing pattern that I eyed up on the front of a sewing magazine but couldn't justify shelling out for. 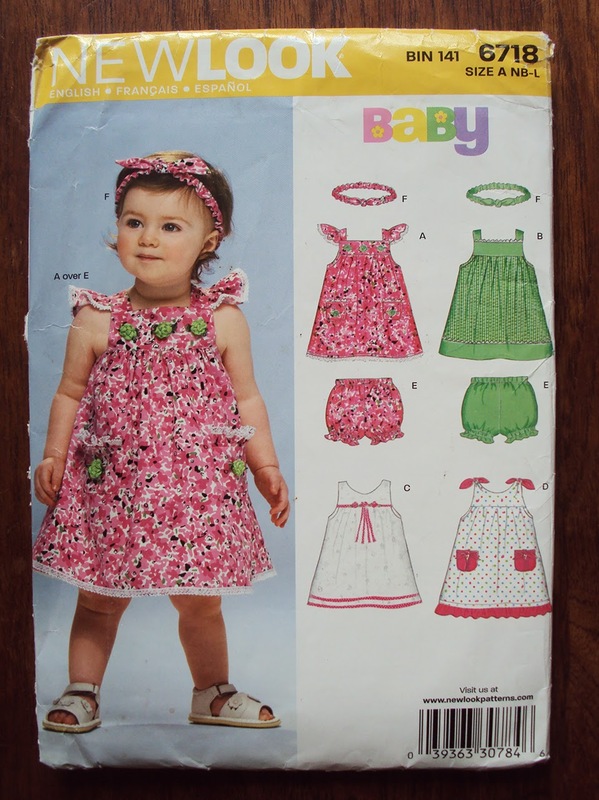 Catherine has kindly sent me several packages and parcels of sewing-related items since my baby was born, as well as getting me hooked on the Ottobre design children's sewing magazines. All three women sent me these patterns because their own children have grown out of the largest size. I aim to honour their kindness by using each pattern at least once and then to pass these on to other worthy sewing-mamas when I am done. The wonderful printed fabric pieces in the bottom row of the image above are all big enough for whole garments. They were given to me by a newly made IRL friend who bought them to make stuff for her own baby girl but can't really be bothered. The deal is, I get to make them into lovely clothes for Dolores, and then pass on the garments to her daughter (who is five months younger) when she's grown out of them. DEAL! So with the awesome sewing patterns pictured above, along with my own modest stash of baby/toddler patterns scored from charity shops and flea markets AND my five copies of Ottobre design AND a couple of Burda magazines AND the patterns from the Perfect Pattern Parcel #2, I think I'm set for Dolores-sewing for some time. Thanks again to those lovely, generous ladies, I'm so grateful. So tell me, what garments have you enjoyed making for your children/other people's children? Which patterns have you used again and again? Hi peops! It was a right old giveaway-aganza round these parts during MMMay'14, wasn't it? Having taken a month off to prevent this being known as 'that giveaway sewing blog', it's time for another one! 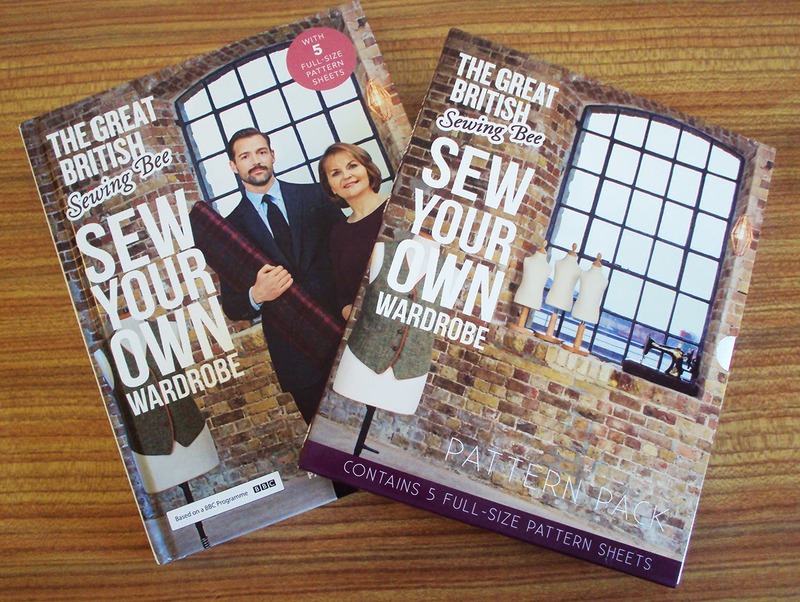 If you recall, back in March I reviewed the 'Great British Sewing Bee: Sew Your Own Wardrobe' book and was surprised to find that it was very awesome. The publishers have been kind enough to offer up a copy to give away to one lucky blog-reader. Unfortunately, due to complicated book licensing laws, this giveaway can only be open to UK and Ireland residents only, sorry international folks. Leave a comment in the comments section of this post telling me who was your favourite competitor of this year's GBSB and why! If I can't access your email address within two clicks, please include it in your entry comment. Email addresses will not be used for anything other than to contact you if you are the lucky winner of this giveaway. To reiterate, this giveaway is open to residents of the UK only and the winner will receive the book completely free of charge. Leave your comment by midnight GMT Tuesday 8th July and the winner will be chosen by random number generator and contacted on Wednesday 9th July. Good luck, my UK-and-Ireland-based book-loving friends!